I feel like Magic design doesn’t make enough use of death triggers on large creatures. When you put such a trigger on creatures like the Kamigawa dragons, it keeps focus on their ability to attack and block – the thing that makes creatures what they are – and not on running away on value just because you reached six mana. Of course, not all death triggers are equivalent, and Kokusho’s is ridiculously exploitable. Letting it through the printing process seems insane by modern design standards, but Commander was not widespread in 2004, and they imagined only a ten-point life swing by default. Multiplayer existed, but it was not as ubiquitous as it is now that EDH is everywhere. There is basically no fair way to use Kokusho in a multiplayer setting, and it doesn’t even take a card like Carrion Feeder to make him unfair: the majority of removal spells send things to the graveyard by default, so unless you include no death-matters or sacrifice effects and thus remove one of the best reasons to play black in that format in the first place, you’ll either break the table or break the format. And now we take a detour away from Chinese mythology to wander back to one of Magic‘s most infamous blocks, the Japanese-inspired Champions of Kamigawa. The set included a cycle of five spirit dragons, legendary 6-mana 5/5 flying creatures with death triggers (usually related to the number 5 somehow). Of the cycle, the most notorious member was Kokusho, the Evening Star, black’s representative. The reason Kokusho was notorious (in a good way) was because of the death trigger being the most powerful: draining 5 life from each opponent. Part of why modern draining effects are “everyone loses X and you gain X” instead of “everyone loses X and you gain the total” is because of how horrifying they are when they scale to multiplayer settings, and gaining 15+ life from a single creature dying is a great way to make friends! This isn’t to say Kokusho was useless in Constructed, though. He was one of the big chase cards from Champions of Kamigawa, thanks to how the rules around legendary permanents worked. If you were to cast a second Kokusho, both of them would meet with an unfortunate death experience…and both of them would grant you their death triggers. Any sort of Clone effect with this creature got horrifying (and even more so now, with how the legendary rules were changed; you keep one, so a steady stream of duplication effects means a steady stream of life loss). 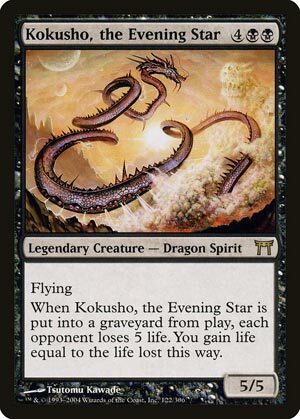 And if that wasn’t enough, Kokusho is still a 5/5 with flying! While abusing his death trigger is the most appealing part of this, you can still get plenty of mileage out of the long dragon swooping early and often. Kokusho is not the most efficient creature in eternal formats, but it can pair well with sacrifice effects and ways to cheat it in; it can work, but be prepared for a rough early go of it.